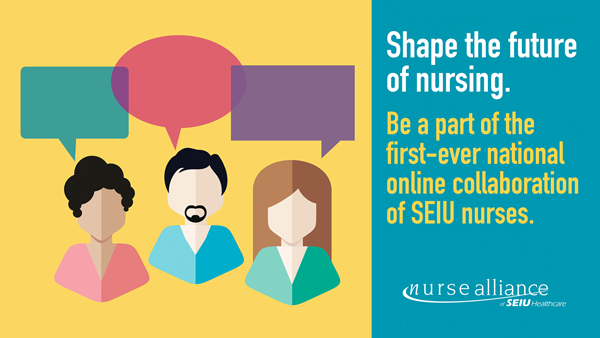 SEIU Nurses, Are You In? Labor Day. Many mark this weekend with end of the summer barbecues or getaways. For some of us, it’s another holiday worked, when the sickest patients remain. As union nurses, however, we should take this day to reflect on the accomplishments we’ve made standing up for quality care, better careers, and just workplaces where hard work is rewarded—and look forward to many exciting opportunities ahead. 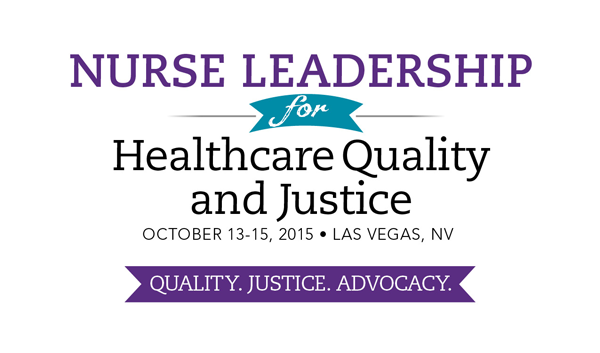 We will be joining together at our biennial Nurse Alliance of SEIU Healthcare conference, “Nurse Leadership for Quality and Healthcare Justice,” Oct. 13 to 15 in Las Vegas. The conference gives us a chance to connect as nurses through collaboration and continuing education, and return home inspired to take action for our patients, our co-workers and our communities. This nurse-to-nurse collaboration will take place starting October 14. It’s an online, moderated discussion and it’s easy to join anytime, anywhere, by smartphone or computer. At the end of this collaboration, a team of nurses will be chosen from among the participants to present our best ideas to healthcare leaders and policymakers. Sign up here to be among the first to know when the conversation kicks off. It’s an exciting time to be an SEIU nurse, whether it’s showing our support for our sisters and brothers in home care who met with Secretary Hillary Clinton or standing up for contracts that prioritize quality patient care. Join me in showing your pride this Labor Day weekend and the weeks and months to come. Like our SEIU Nurse Alliance of Healthcare Facebook page to stay up to date and share the latest developments of nurses and healthcare workers in our union. What’s working: Successes from the front lines of quality care, the power of the nurse voice in hospitals and in the community, and how the Affordable Care Act makes affordable, accessible, secure healthcare a reality for millions of Americans. What’s new: Best practices from our hospitals and clinics, team-based care and operationalizing the quality objectives of the Affordable Care Act. What’s next: Learn how nurses are joining together to fight for economic and healthcare justice. What it means: How to implement ideas and bring them back to your workplace, your patients and your community. Continuing Education Units (CEUs) for this conference are available through the Nurse Alliance of California under the California State Board of Nursing Education Provider No. 3414. CEU certificates will be awarded at the end of the conference. You must stay for the entire CEU session to qualify for credit. SEIU Healthcare Wisconsin members and home care workers in the Fight for $15 joinedSEIU Local 199 nurses to protest Gov. Scott Walker (R-Wis.) as he campaigned for president at the Iowa State Fair. Some wearing purple, some donning “cheeseheads,” the healthcare workers called out Walker’s anti-worker record in his home state. As many as 12,000 SEIU Healthcare 1199NW nurses and hospital workers are bargaining new contracts across Puget Sound hospitals, holding profitable employers accountable to patients, not just the bottom line. A common thread at each bargaining table is the call to invest in front-line care including: improved staffing for patients, affordable healthcare, secure retirements and protecting the successful multiemployer training fund. Community members, small business owners, and elected officials have shown support for nurses and healthcare workers, even joining the informational pickets held at some of Seattle’s flagship and safety net hospitals: Swedish-Providence, Harborview andValley Medical Center. Follow the progress of these brave sisters and brothers and post a message of support on the SEIU Healthcare 1199NW Facebook page. Way to break the ice. Watch 1199UHE nurses and other members attempt to break the world record as part of the largest ice bucket challenge to raise money and awareness for ALS. Nurse Alliance of SEIU Healthcare leaders attended a roundtable recently where former Secretary of State and presidential candidate Hillary Clinton sat down with union and nonunion home care workers. The caregivers shared how there are not enough home care workers to care for the escalating number of baby boomers turning 65—an issue also familiar to nurses. The women, many leading the Home Care Fight for $15 in their home towns, also described the need to work long hours to afford the basics for their families. Read this blog by Dian Palmer, the Nurse Alliance chairperson, that describes how she was affected by the women’s stories and Clinton’s response. Efforts to attack Planned Parenthood solely to advance a political agenda have put the health and well-being of the 2.7 million women, men and young people who rely on the centers for basic preventive care at risk. In fact, one in five women will rely on Planned Parenthood for healthcare in her lifetime. While Senate Republicans were unable to garner enough to votes to block Planned Parenthood’s federal funding, more efforts to defund the organization are expected. Read President Mary Kay Henry’s statement calling out these extremists and take action in support of Planned Parenthood here. Americans want unions: An increasing number of Americans agree what SEIU members already know—membership in a labor union can be extremely useful for workers. Nurses and technology can mix: A webinar discusses the importance of including nurses, members of the healthcare team who are the primary users, in the selection of electronic health records, particularly in long term care settings. Happy Birthday, Medicare and Medicaid: The most significant healthcare services of our time turned 50 and they’re only getting better with age.